What Can We Expect Out of Monero’s Price? It’s been a while since we’ve covered the price of Monero, so what better time to do so than now? 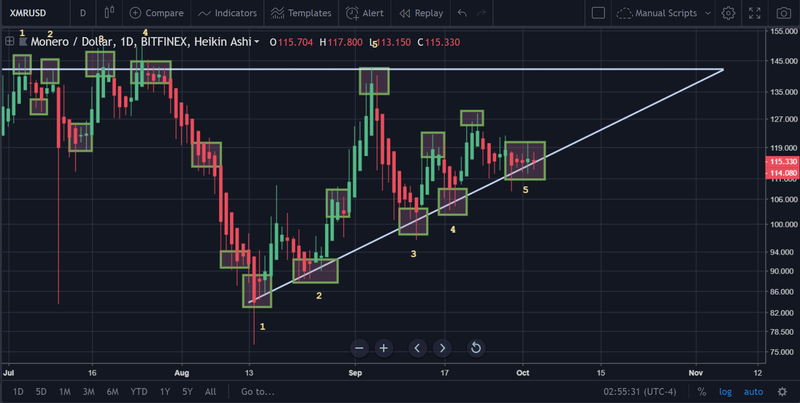 Specifically, we will be looking at the $XMR/USD chart pairing after doing a little bit of fundamental analysis first. The post-mortem report noted that exchanges may have been vulnerable to the bug at some point in time. However, according to the Monero team, there was no report of any actual, real exploit of the bug. 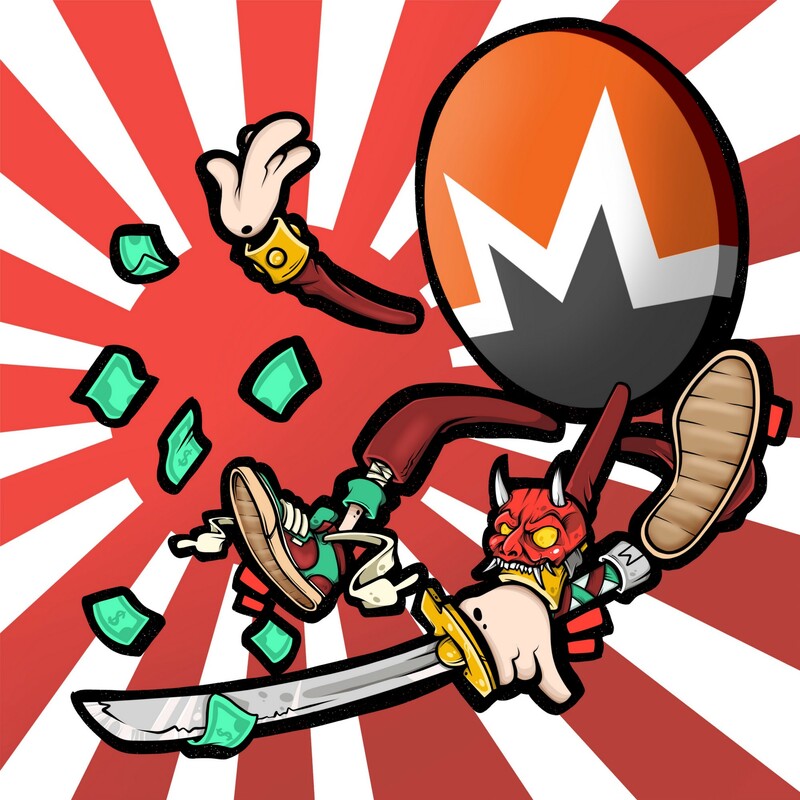 However, the impact was still noted in the cryptocommunity at large and seen via the price when it was observed by numerous traders that Monero appeared to be lagging behind other cryptocurrencies in terms of its growth and gains. To get a better idea of price action, its best that we revisit our charts on the daily resolution (USD pairing). In the picture above, a clear flat top triangle can be observed. 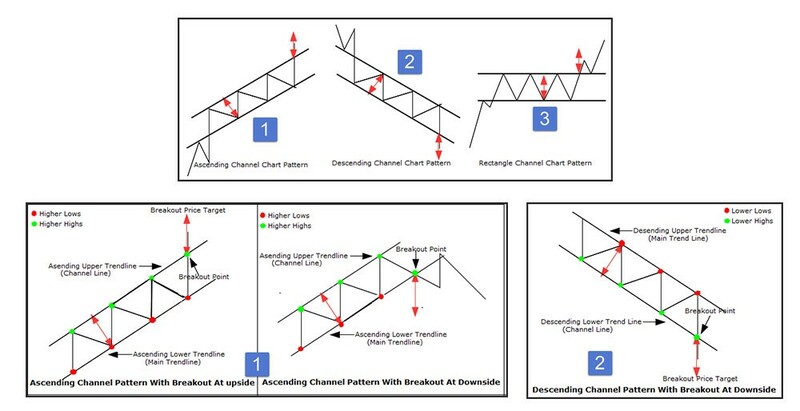 As you can imagine, this chart pattern generally involves a…flat-top triangle. 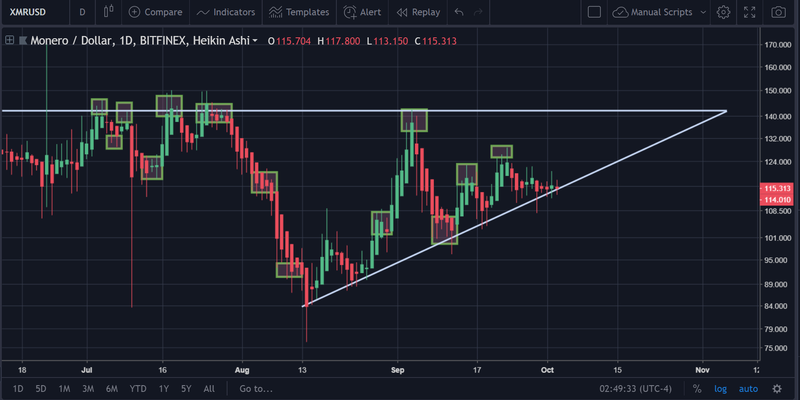 Essentially, this pattern is considered to be bullish, with the price typically breaking to the upside after it reaches the apex of the triangle or close it. There being a series of ‘higher lows’ that occur in conjunction. 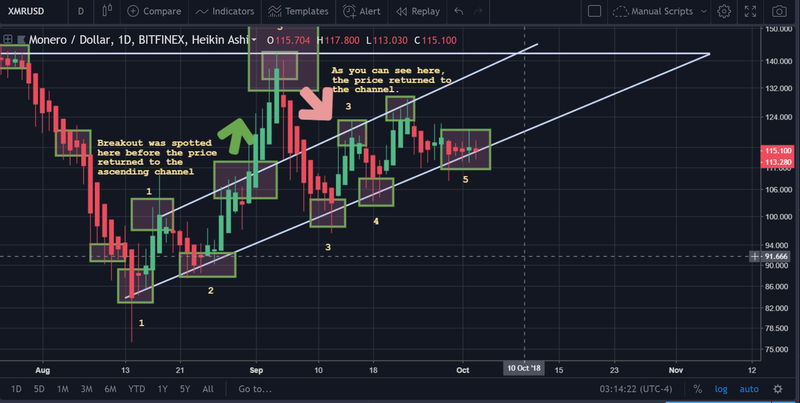 In the above chart, we can see this $140-$142 price range being tested multiple times (five in total), thus far. There is also an ‘internal stack’ of higher highs that can be observed on the chart as well. 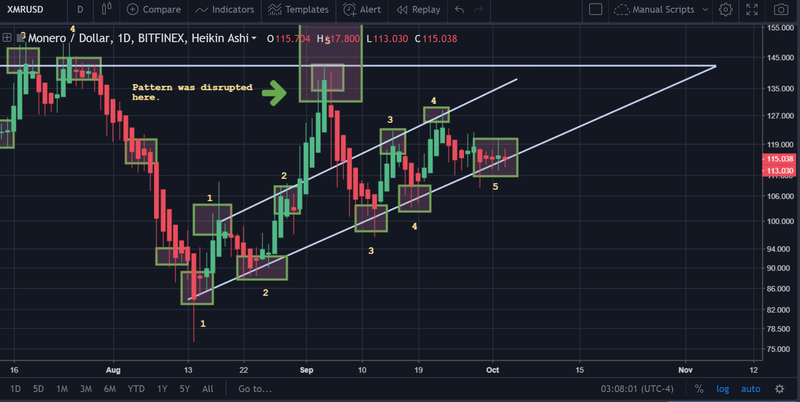 Now, if you look carefully at the original chart above where we identified that this ascending price channel had formed, you can see where the price broke out. So, from where the price is at this very present moment in time, it makes sense that it could break upward right? As seen in the example graphic posted above, the price can either break below or above the channel. 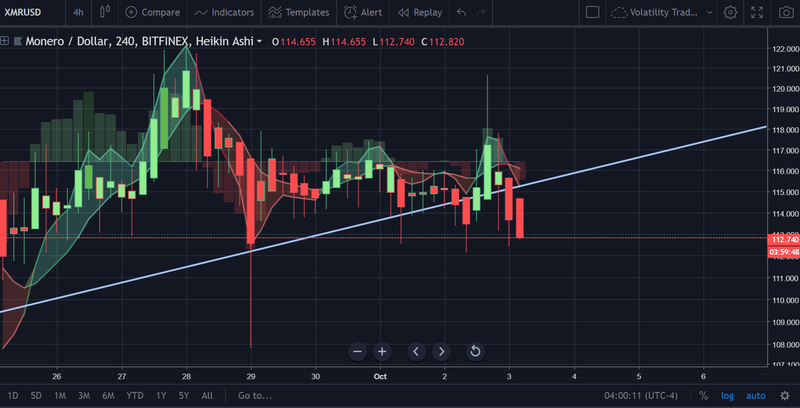 The price is currently trading against the bottom trendline. 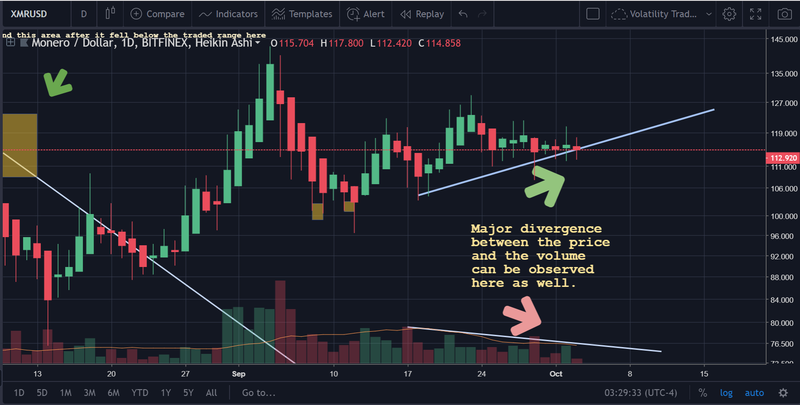 The volume has been abysmal and lower than average, which means that a surge in volume coupled with a break below the trendline could signal a precipitous decrease in the price. Let’s review some of the indicators though for Monero first before making any assumptions, shall we? 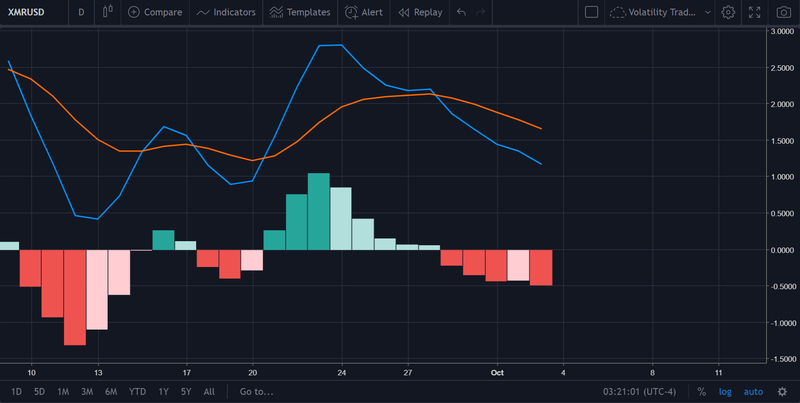 The histogram on the MACD (daily resolution) for Monero showed that there was originally a convergence in the two MACD(blue) and the Signal(orange) lines, before eventually the MACD crossed below (bearish) the Signal line, and now this ordering has seen increasing divergence (larger and larger red candle bars) for the daily resolution. This is bearish, plain and simple and a pure confirmation of the major bearish undertones that can be seen in the indicators but not necessarily in the price right now (since its been pure consolidation). 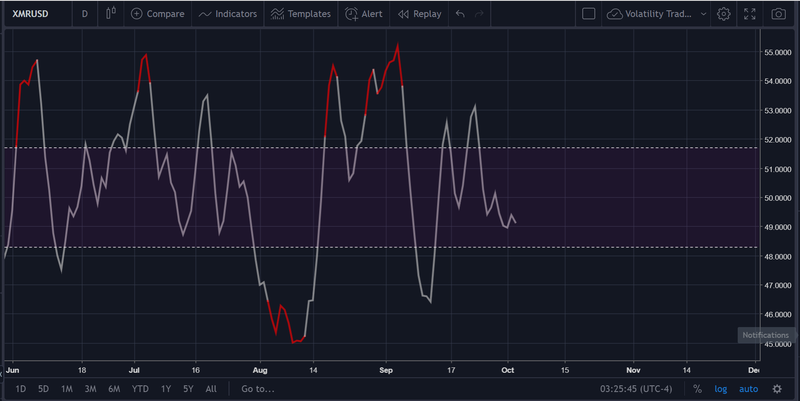 The RSI(14) is showing us a clear bearish trend in the price on the daily resolution and the worst part is that it appears to be nowhere near close to the oversold point, so the RSI can decline much further yet still. Similarly, the RSI Balance of Power (custom indicator) also reflects a major increase in sell volume for Monero over the last few days. 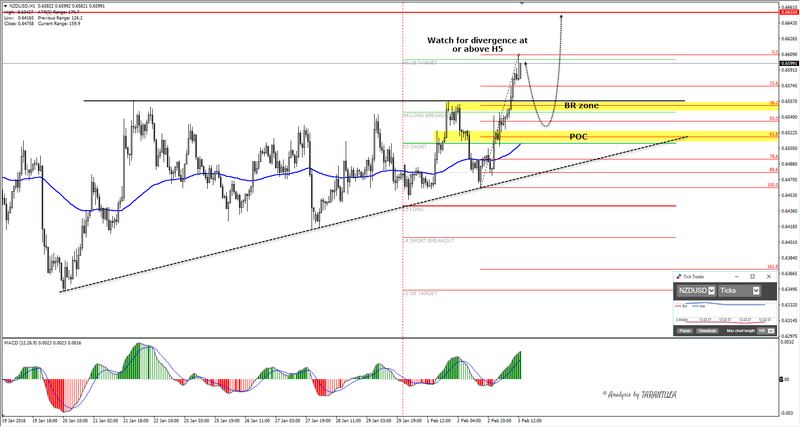 A) The primary buyers of the market have more than likely already exited their positions. B) There will be an impending drop in the price the second that the volume picks up. This custom indicator works akin to how the MACD does, except it provides a colored fill between the MACD and the signal in order to give a better idea of when a sell signal has been confirmed or not. What this indicator shows, in essence, is that Monero’s price action has been floundering in recent periods. All signs are pointing to the conclusion that Monero investors should be expecting a dip in the price soon. Given the fact that the price is right against that uptrend resistance in the ascending price channel that we identified, the fall could be precipitous in nature. Below are some price targets for where the author estimates that the price will ‘land’ at. Disclaimer: None of the contents of this article should be construed as financial advice in any way. The author is not a financial advisor, was not paid by Monero or any of its affiliates for writing this article, and has no active investment in Monero although the author has a small holding of less than $100 in Monero funds from business transactions unrelated to crypto investment and is not intending on profiting from the appreciation of said holding.